The roles of the regulatory and self-regulatory organisations involved in the control of over-the-counter medicines advertising are described below. Also listed are the sanctions available to the organisations that deal with complaints and/or breaches of the codes/regulations. Please refer to table 3 summarising the organisations from which advertisers are required to obtain prepublication approval for consumer advertising and to table 4 summarising the codes that apply to various consumer promotional activities. MHRA is an executive agency of the Department of Health whose role it is to safeguard public health by ensuring that medicines and medical devices are effective and acceptably safe. Part of MHRA’s role is to monitor and enforce Part 14 of the Human Medicines Regulations 2012 on behalf of the health ministers. MHRA is responsible for deciding if legal action will be taken against any advertiser under Part 14 of the Human Medicines Regulations 2012. The key principle is that advertising should not mislead and should reflect the terms of the product’s Marketing Authorisation. The regulations specifically allow complaints under Regulation 9 to be referred by MHRA into the self-regulatory system. MHRA monitors advertising and also acts on complaints received concerning possible breaches of Part 14 of the Human Medicines Regulations 2012. Breaches of the Medicines Act 1968 and Regulations invoke separate and distinct sanctions that may be civil sanctions (e.g. withdrawal or amendment of advertising, injunctive powers to prevent issue of an advertisement, requirement to publish a corrective statement) or criminal sanctions (e.g. a fine of up to £5,000 on summary conviction, a fine of up to £5,000 or imprisonment for up to two years, or both, on conviction or indictment). Companies may appeal to the Independent Review Panel regarding MHRA rulings. The Committee of Advertising Practice is the industry body responsible for the UK’s advertising codes. Its non-broadcast Committee, CAP, writes and enforces the UK Code of Non-broadcast Advertising, Sales Promotion and Direct Marketing (the CAP Code), which applies to non-broadcast advertising. The Committee comprises representatives of advertisers, agencies, media owners and other industry groups (including PAGB), all of which are committed to upholding the highest standards in advertising. CAP offers a free, pre-publication copy-advice service. The CAP Code does not apply to health claims in materials aimed at health professionals. CAP’s Broadcast Committee is contracted by the broadcast regulator, Ofcom, to write and enforce the codes of practice that govern television and radio advertising, the BCAP Broadcast Advertising Standards Code and the Advertising Standards Code for Text Services. The Broadcast Committee of Advertising Practice, BCAP, comprises representatives of broadcasters licensed by Ofcom, advertisers, agencies and direct marketers. The ASA is the independent body that is responsible for ensuring that the system operates in the public interest. Each year the ASA receives approximately 25,000 complaints about UK advertisements. Complaints are assessed against the CAP Code, the BCAP Broadcast Advertising Standards Code, or the Advertising Standards Code for Text Services, as applicable. If a complaint is upheld, the ASA asks the advertiser to withdraw or amend the advertising. Broadcasters are obliged, by a condition of their Ofcom licences, to enforce ASA rulings and not to run advertisements that have been found to breach the codes. Similarly, if non-broadcast advertisers do not comply with adjudications, CAP can issue an ‘Ad Alert’. Ad Alerts ask those responsible for accepting ads for publication to consult CAP’s Copy Advice team before accepting any ads from the advertiser named in the alert. If advertisers do not co-operate with the self-regulatory system, the ASA can refer the advertiser to the Office of Fair Trading. The ASA publishes adjudications on investigated complaints each week on its website (www.asa.org.uk). This generates a high volume of adverse publicity for advertisers who breach the codes. Advertisements that break the codes are disqualified from industry awards, denying them and the agencies that created the ads the opportunity to showcase their work. Advertisers and agencies who persistently breach the Code jeopardise their membership of trade organisations. In exceptional circumstances, an advertiser may apply to have an ASA adjudication reviewed if new evidence can be provided in defence of claims or if the advertiser can demonstrate a significant flaw in the adjudication or in the decision process. Ofcom is a statutory body set up under the Communications Act 2003. Amongst a broad range of roles as communications regulator, Ofcom must ensure that the content of programmes and advertising on television and radio meets appropriate standards. Ofcom has contracted out the regulation of broadcast advertising to the ASA and BCAP. Ofcom has retained responsibility for sponsorship on television and radio. The sponsorship rules can be found in the Ofcom Broadcasting Code. Clearcast is the company responsible for the pre-transmission examination and clearance of television advertisements. As part of their licensing agreements with Ofcom, broadcasters are required to ensure that the advertising they broadcast is not misleading or harmful to viewers. Broadcasters choose to do this by pre-clearing advertising before it is broadcast. Clearcast is owned and funded by eight commercial broadcasters, all of whom are represented on Clearcast’s board and all of whom use Clearcast for clearing advertising. Other broadcasters using Clearcast for clearance pay individually for Clearcast’s services. Advertising is cleared in accordance with the BCAP Broadcast Advertising Standards Code and Clearcast’s own Notes of Guidance. PAGB member companies are required to submit television advertising material to both Clearcast and PAGB. The Radio Advertising Clearance Centre (RACC) is the self-regulatory body responsible for prevetting radio advertising copy. It is required and authorised by the regulator of commercial radio, Ofcom, to approve advertising copy in advance of broadcast. It therefore translates practically the requirements of the BCAP Broadcast Advertising Standards Code. RACC is funded by all licensed radio broadcasters. All radio advertising for medicines must be cleared by RACC before transmission. PAGB member companies are required to submit radio advertising materials to both RACC and PAGB. RACC has access to independent medical and nutrition advisers. The primary function of CAA is to promote, monitor and maintain standards of cinema advertising. This includes pre-vetting all cinema commercials to ensure conformity with the UK Code of Non-broadcast Advertising, Sales Promotion and Direct Marketing (the CAP Code). CAA Copy Panel clears commercials for exhibition in cinemas in the UK and the Republic of Ireland. No commercial may be exhibited in a cinema unless it has been cleared by CAA. PAGB is the self-regulatory body for over-the-counter medicines advertising. It offers a prepublication approval service for consumer advertising in relation to over-the-counter medicines and food supplements, and advice on advertising aimed at professionals. Details of these services are given in sections 1.4, p7-10 and in the PAGB Consumer Code for Medicines respectively. PAGB runs a post-publication complaints system for advertising aimed at persons qualified to prescribe and supply. PAGB is unable to adjudicate on formal complaints about member companies’ consumer advertising as it will have approved the advertising prior to publication. 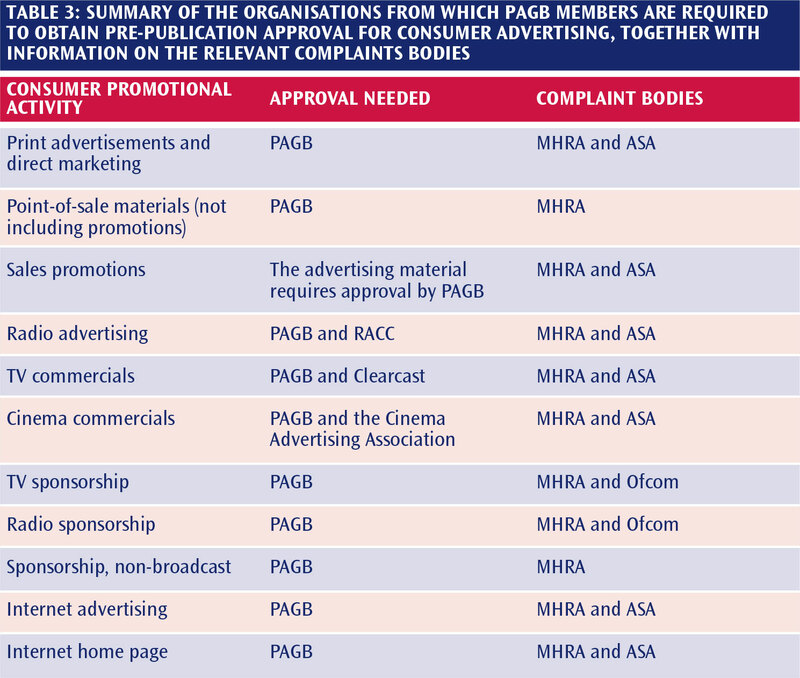 Details of how PAGB deals with complaints regarding professional advertising and informal queries regarding consumer advertising are set out in ‘PAGB’s Standard Operating Procedure for Member Companies’ Informal Queries and Complaints Regarding Competitors’ Over-the-Counter Medicines Advertising’. The PAGB Secretariat is responsible to the PAGB Board. The Board delegates matters of day-to-day interpretation of the PAGB Medicines Advertising Codes to the Secretariat. The Board are entitled to review any decisions of the Secretariat and to give general or specific guidance to the Secretariat on the interpretation of the Codes. Any PAGB member company can request a review, by the Secretariat, or the Board, of a Secretariat decision or point of interpretation. The process for requesting a review by the Board is set out in ‘PAGB’s Standard Operating Procedure for Member Companies’ Informal Queries and Complaints Regarding Competitors’ Over-the-Counter Medicines Advertising’. 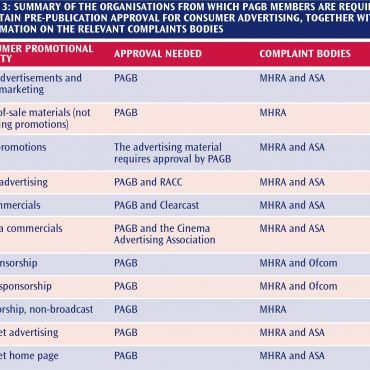 The table below is intended as a useful reminder as to the organisations from which members are required to obtain pre-publication approval for consumer advertising, along with the relevant complaint bodies. Please note, in certain circumstances MHRA may also require Marketing Authorisation holders to submit their advertising for pre-vetting.